It’s almost summer here in Scotland and you could be thinking about spending more time in your garden. It’s a great time to think about ways to make your outdoor space look great so you can relax and enjoy the sunshine. If you’ve never thought about installing some outside lighting before, it’s well worth considering. Here are our tips for coming up with the perfect lights. It’s wonderful being able to sit outside enjoying a drink on a summer evening or getting your friends and family round for a barbecue. Good outdoor lighting will allow you to carry on enjoying your evening after the sun has gone down. To work out where your lights need to go, think about where you spend the most time. Position lights near your garden seats so that you and your guests can carry on chatting. Of course, it’s important to think about your neighbours as well. Make sure that any lights you install won’t disturb them if they retreat inside earlier than you. Outside lighting can be wonderful for camouflage. When it’s dark you can use your lighting to highlight the best parts of your garden and hide the areas you’d rather not display. If you have a beautiful garden feature, for example a tree or a lovely pond, why not show it off? You can use an uplighter at the base of a tree or create a subtle glow around your pond. 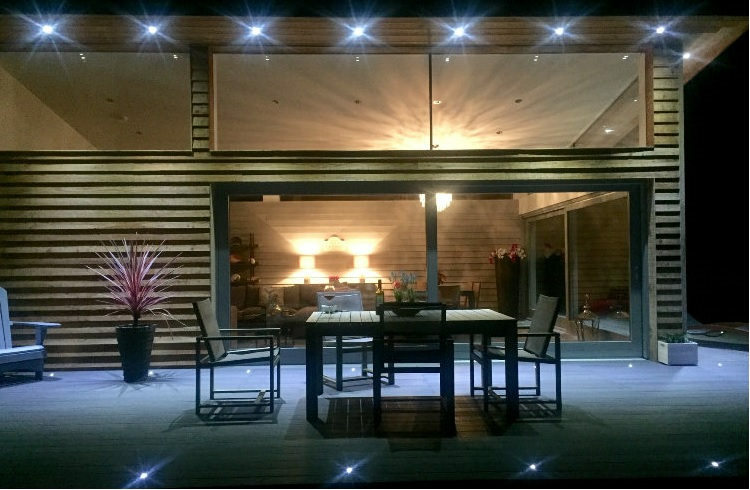 Depending on the lighting you choose, your favourite garden feature could be transformed at night. You won’t just get to enjoy the warmer weather, it will enhance your enjoyment of your garden too. We’ve already mentioned some things to consider when you’re positioning your lights. It’s just as important to think about the atmosphere you want to create. An afternoon in the garden that carries on into the evening is great for relaxation. The last thing you want is to shatter the mood by turning on lights that are too bright. We generally recommend using up lights in garden seating areas as the light is quite subtle. By contrast, lights that point downwards often feel overly formal. If you’ve used lighting around any features, this will create layers of lighting that give a lovely effect overall. When you’re using your garden at night, safety should be a key consideration. Make sure that any steps or paths are clearly visible so you can go inside safely when you need to. This is especially important for guests who might not know your garden as well as you do. If you have any potential hazards, for example an uncovered pond, make sure that’s highlighted too. Of course, there are more general safety considerations when you install outside lighting. Your lights will be exposed to the elements throughout the year. Make sure that your lights are installed by a qualified electrician who will ensure that your lights meet all the right safety standards. If you need assistance with selecting and fitting the right outdoor lighting for your needs, please get in touch. Capital City Electrical can help you to design outdoor lighting that will transform the look of your garden and allow you to enjoy your summer evenings to their fullest.